Happy Monday friends! I'm still trying to recover from the whirlwind of a weekend in New Orleans and need a couple extra cups of coffee this morning, but that just means it was a great weekend, right? We left for New Orleans on Thursday, which honestly should be nicknamed the city that never sleeps because Bourbon Street doesn't shut down until at least 5:00 AM...I know this because we were up for our flight yesterday and people were still stumbling home! 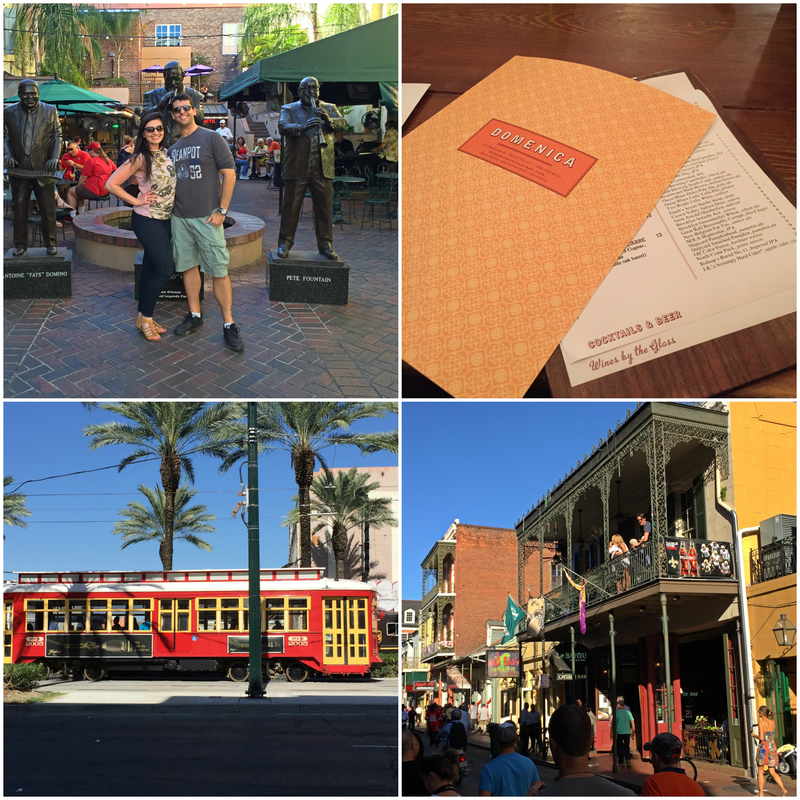 I honestly didn't know what to expect from New Orleans - perhaps a little southern charm mixed with some excitement, but what I got was a lot more. Our hotel was right on Bourbon Street, so you can imagine my concern when I realized that we could hear everything outside. Gary and I hightailed it to the nearest CVS and found silicone earplugs - best $5 I ever spent!! These things fit into your ear and you can't hear a thing - seriously if you have a hard time sleeping because of noise or anything like that try these- I wont be traveling without them again and think that every single hotel needs these in their lobby! Now that I've hit my tangent for the day here's how we saw New Orleans in a day in a half and still had time to make it to a Gator game in Baton Rouge! You'll notice a few tips spread throughout this post - these were things we did that made the trip worthwhile and we didn't feel like our time was wasted! Our first half day was spent getting acclimated to the city and wandering Bourbon street- if you saw my snaps from this weekend you might have heard my serious concern for the goings on at 3 in the afternoon! We had apps and drinks at Domenica Restaurant in the Roosevelt Hotel on Thursday and I've forgotten what a treat it is to actually have happy hours! After a quick meet up with Amanda and her hubby along with some of their friends and family we headed out to explore the city! Tip: Go to Jackson Square at night and really see the views from the hill across the street! The sunset was gorgeous and unlike anything I had seen - actually all the sunsets in Louisiana this weekend rank as the best I've ever seen! After some quick pictures we made our way to Cafe Du Monde - it might not be advertised as 24 hours, but this place is open ALL the time! So we skipped the lines and knew our chance at deliciousness was going to come at night. I had been talking up beignets the entire week to Gary and he totally loved them too! sorry the picture is grainy - I stole it from my own snap chat because I couldn't wait to dig in! Tip: If you want to skip the lines and not have to worry about wasting any time, try to go at night to Cafe Du Monde. You'll get a table and enjoy your beignets without having to rush through the experience and its also cash only! We totally did Thursday night backwards and it was amazing! 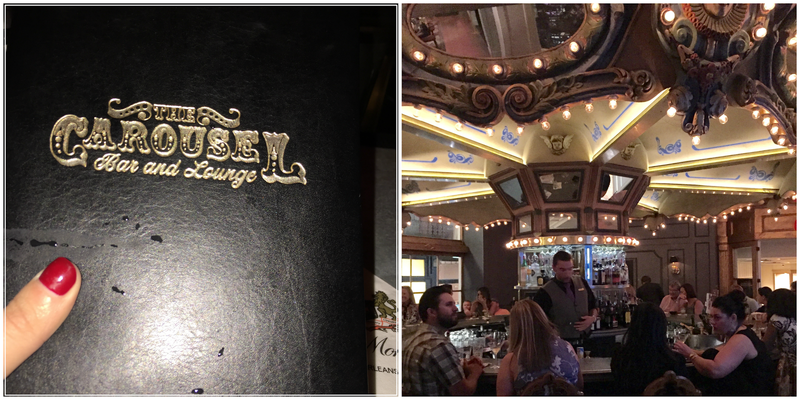 After dessert we made our way to the Carousel Bar located inside the Hotel Monteleone. I'd heard really fun things about this bar and the carousel actually moves - they say it takes about 15 minutes for a full rotation, but sadly we weren't able to find a spot so we sat at the other bar and had the best service! Highly recommend a visit here! 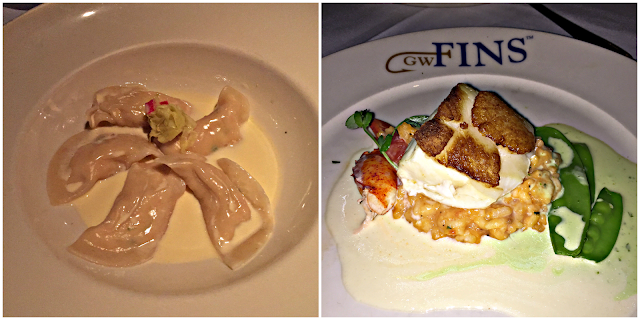 I was excited for dinner on night one more than anything because I managed to get a reservation at GW Fins. Its one of the more famous restaurants in New Orleans and for good reason. I kid you not, this was hands down top 3 meals I've ever had!! We started with the lobster dumplings which melted in your mouth they were so good and then split the dish they are most known for - the scalibut. That would be scallops baked on top of halibut. The service was superb and we both couldn't stop raving about how good the food was! Friday was the only full day we had in New Orleans and we made the most of it. Before we left I made reservations for two tours - both of which would hit the highlights of everything that we wanted to see and everything that was recommended to us! After some research I booked Free Tours By Foot - which allows you to pay what you think the tour is worth - both tours were incredible and well worth the price we ended up paying. Tip: You get a lot of bang for your buck with these tours and it feels good paying the tour guides what they deserve instead of what the company charges. They pretty much do ever tour you can think of! We started our morning with a tour of the French Quarter. Our tour guide Elizabeth was incredibly knowledgeable about her city and it was fun getting to learn the history behind the gorgeous city! I fell in love with the architecture of New Orleans- everywhere you turned there was another beautiful building to snap a photo of! Since the area is rather small that we toured - I did find the 20 minutes we spent in the park to be overkill and honestly part of the tour could have been condensed, but aside from that it was great! The Garden District was such an amazing tour. Gary and I were both so impressed with our tour guide Kat's knowledge - probably because she lives in the area and is really proud of the beautiful district. 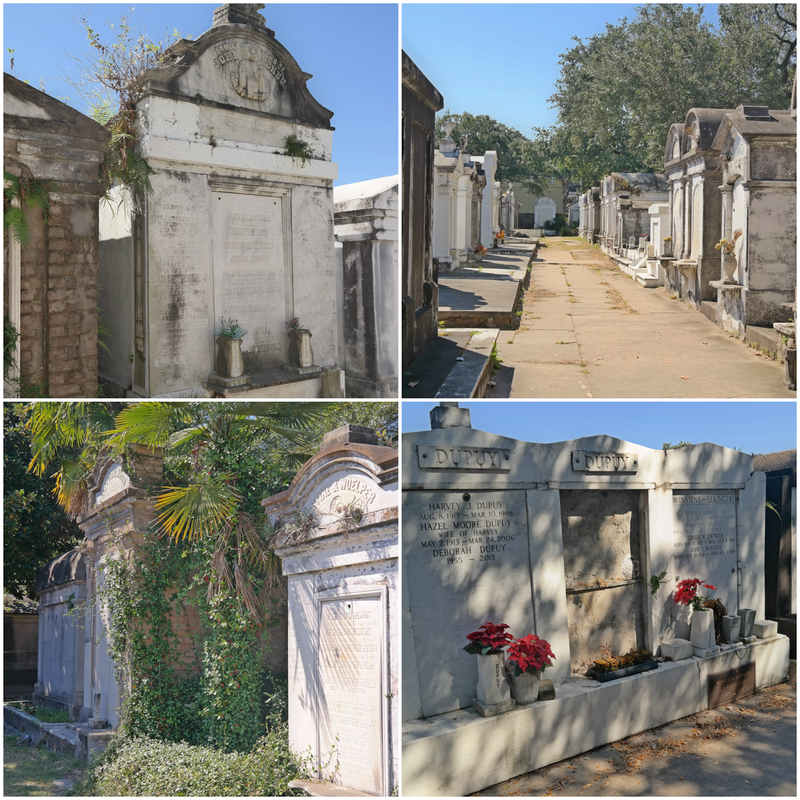 Before booking the tour I looked at what would be covered and funny enough I had been wanting to visit the Lafayette Cemetery since seeing it in Double Jeopardy (carousel bar also appears in the movie). I felt a little weird taking pictures of these graves and headstones, but they are truly works of art that have been with families for generations. 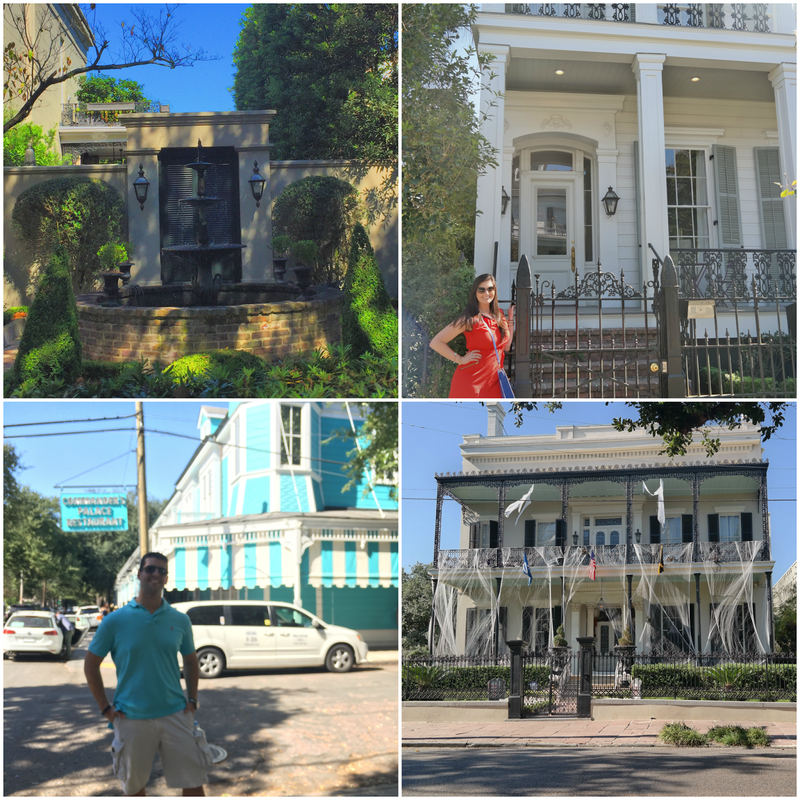 We walked about a mile in total around the Garden district and I was so surprised to hear how many celebrities actually lived in the city - John Goodman, Sandra Bullock and the newest neighbors in town Beyonce and Jay Z! If you take any tour in New Orleans, I highly suggest this one - it was a great 2 hours and for those that love Charleston will remind you a lot of that city as well! Since the fun way to get from upper New Orleans to the Garden District is the street car we took it both ways and they have it in the same condition as they did back in the 1920s! That means no AC and really loud breaks! It's only $3 to get an all day ticket andH. Tip: Have exact change - they don't take cards or give change! We met up with the crew again for happy hour at Lüke in the Hilton Hotel. 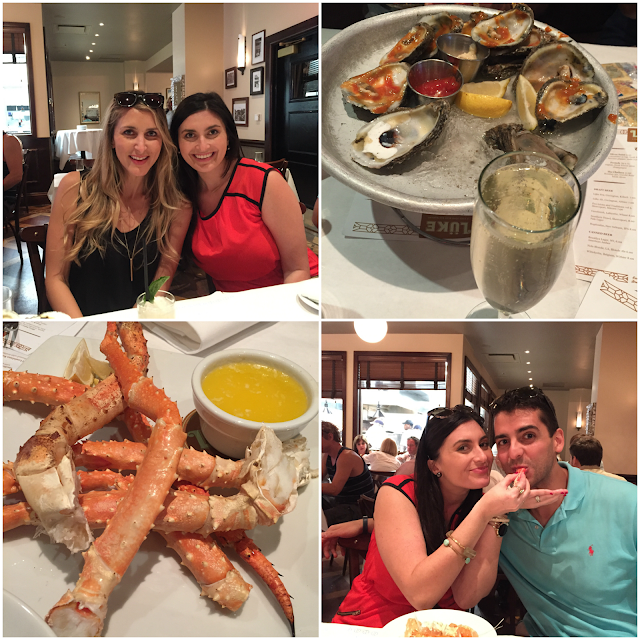 We opted for crab legs instead of oysters, but sometimes I think they are more work than they are worth...but its seafood and I love seafood! On the way back to the hotel we saw not one but two second lines! Another well known restaurant is the Red Fish Grill - which is where we ended up going to on Friday night! Tip: Having the open table app on your phone makes making reservation so easy on the go. Someone on our tour mentioned how delicious their dinner was at Red Fish the night before and I popped open the app to see if they had any tables available and we were in! We had alligator bites - my first time eating alligator and the way they make it was incredible! It tasted more like a meatball than anything else and it was sensory overload because of the sweet and salty spread they had! We also went with their Red Fish that their known for and it was flaky and perfectly cooked - a reason its their top ordered item! Even if you aren't a big partier there is plenty for you to do in New Orleans - especially if you're a seafood lover- the food is so fresh and the quality of service you get at the restaurants is wonderful! Since the Gators were playing in Baton Rouge we rented a car and made our way out of the city. It was a quick hour to the campus and before we knew it we were ready to tailgate. 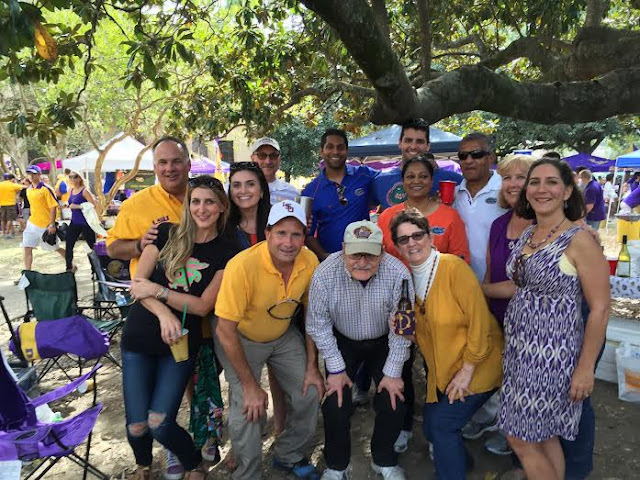 Amanda and Mark had met some LSU fans two years ago and they invited them back for this tailgate this year. They were so nice an inviting and let's be honest we're all friends until the game starts right?! Our seats were in the heart of Tiger land...yikes! Guess they call it Death Valley for a reason! Sadly the game didn't turn out in our favor, but the sunset earlier in the evening almost made up for the loss. It was a nail biter and I think we both lost our voices - it was well worth the trip to see the boys play their hearts out - such a great game!! Even the pup is a fan! 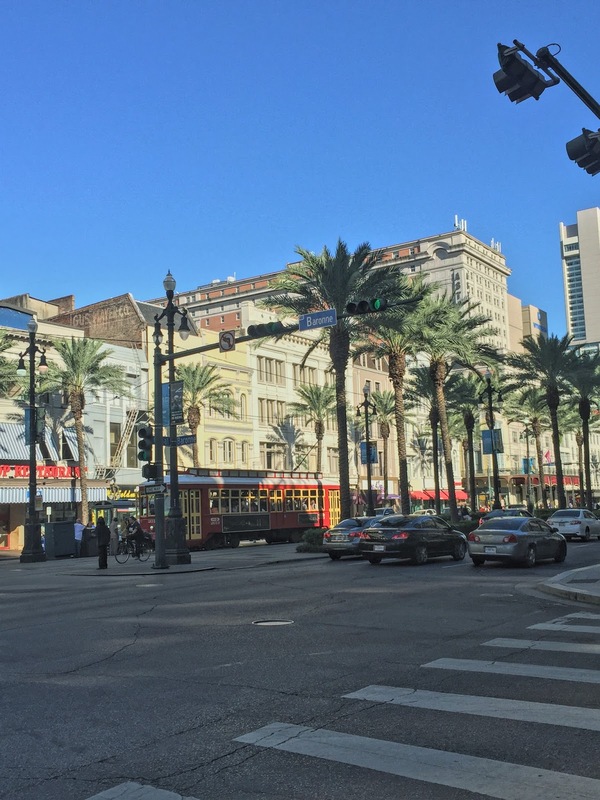 New Orleans was always on my list of cities to visit and I'm so glad to cross this one off! Its wild and crazy, but even if you're not into that there is something for you to try! I wish we had more time to taste some more foods, but for really only having one day in the city we managed packed it all in! I've heard from so many people how much they love NOLA and I see the appeal! The people are friendly and the city is beautiful! If you made it through all of that - thank you! I'm still a bit delirious from the weekend of late nights so excuse me while I find a bucket of coffee! Y'all sure did NOLA right. Your pictures make me so nostalgic. I'm so glad you had a great time :)! Wow! I have always wanted to go to New Orleans. The food, the history-everything, looks amazing! Have a great day! You guys looked like y'all had such an amazing time! Loved keeping up with your snaps and seeing what y'all were doing! That picture of the purple dog has me in stitches every time I see it, hahaha. Poor puppies get pimped out for our entertainment purposes, haha. PS: GREAT Game Day dress!!! Wow, you squeezed so much in to your adventure in such a short time! And so much deliciousness :) Here's to Monday morning! The photos you took are amazing ! The food you ate looks fabulous, I've never eaten alligator so I'm not sure about Alligator Bites ! Thanks for sharing. Look like y'all had so much fun! Isn't Bourbon street crazy?! I couldn't believe what we saw at all hours of the day! Domenica is one of my favorites there, looks like you had a blast! I loved following along with your weekend on snapchat! I had serious envy over y'alls weekend as I sat at home! Wow you seriously packed a lot in! I am drooling over all of that food and that sunset at the game is gorgeous! New Orleans is definitely on my list of places to visit! What a fun weekend! Your recap is wonderful! I like be that you did tours, I never think to do them, we usually just wing it. Did you eat your beignets with chocolate milk? Omg so good!! Your trip looks awesome! If love to hear a post one day about how you choose your restaurants while traveling- without fail you always seem to eat at top notch spots! You guys got so much in!! Those earplugs are THE BEST! They are the only ones I can use!! I've heard that the noise at an LSU football game has caused earthquakes - true? 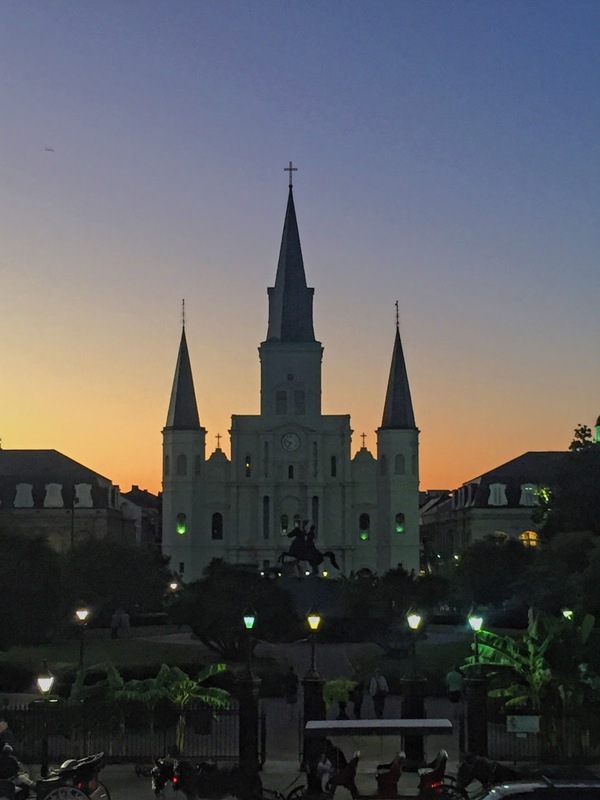 That picture of Jackson Square is AMAZING!! I so wish you had gone to New Orleans before we did! I went years ago with a friend that lives in Baton Rouge so she knew all the places to go and see. This time when I took my parents I was clueless and it wasn't nearly as much fun for them I don't think. The first tour should have been on our list as we tried to walk the street by ourselves and didn't get the full experience at all! Love that you guys tailgated with LSU fans, it's all just a love of football, until the game starts! I have heard great things about New Orleans, especially after the re-build after the hurricane. Your trip sounds fantastic, you got to see and do so much. It is definitely a city I want to visit. Thanks for your tips. And thank God for ear-plugs. Love the maxi skirt and orange dress from these photos too. Such a stylish girly girl you are, Biana! Looks like you fit a lot into those few days. I am not a seafood person so I might starve if I went there. Haha! I really want to make a trip out though I love the old mansions and porches they have there. 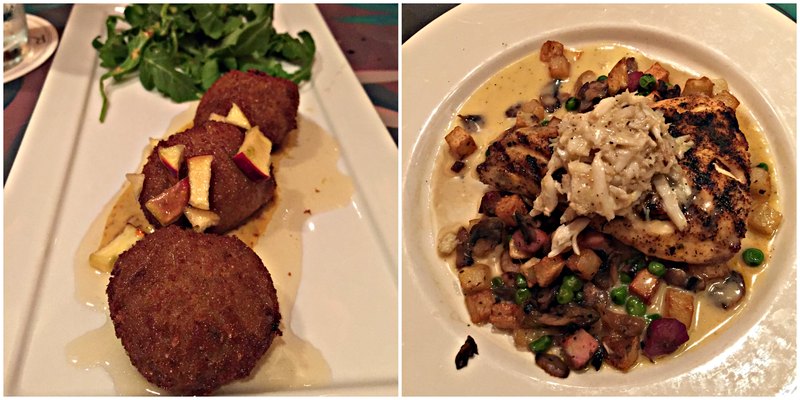 So much food to try in New Orleans but it looks like y'all managed to try as much as possible in a weekend! Jackson square looks beautiful at night, and I completely agree about eating at Cafe du Monde at night to avoid crazy lines. You're very brave for going to a game at Death Valley, I don't know if I would've been able to handle it! New Orleans is such a fun city! The pay Free Tour by Foot is such a cool concept! I wish more cities did that. We ate at GW Fins too and it was SO good!! WOW! You guys really made the most of your trip!! I can't believe how much you fit in! I'm drooling over every single one of those meals!! Glad you had a good time! While I have no imminent plans to go to New Orleans, it's on my list in the next few years and Cafe du Monde is always something I've known I wanted to do. So it's fabulous getting your little tip about night time! I'll have to file that away because getting to enjoy the atmosphere and food is much more pleasant than the rush - even for delicious and known stops. How did you do it all? Friends, football, and all that sightseeing and eating!! So amazing!! Loved following along with you on Insta! I really want to go to NOLA. Love these recommendations - and the food looks absolutely amazing! 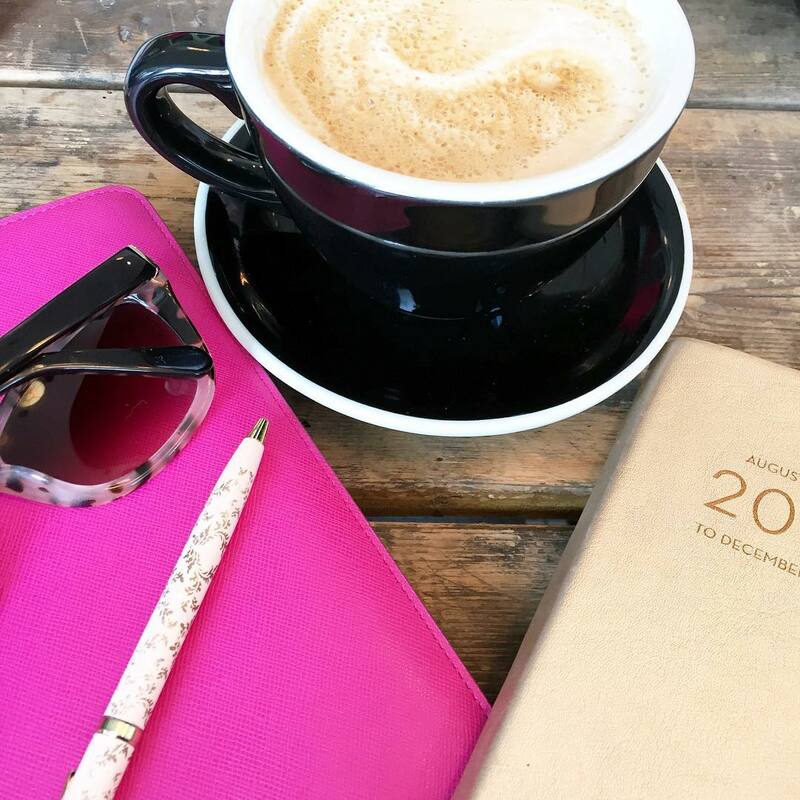 Loved reading about your weekend and seeing some of your Instagram posts! I have never been but it looks like a blast. I would like to go just for the food! Everything looks delicious! I'm not into the party/bar scene and I don't like seafood but I've always thought New Orleans would be an interesting place to visit. There's just so much history and neat architecture to see. OMG!!! What an amazing long weekends! I just love New Orleans! But I can't believe you stayed right on Bourbon Street! ;p i'm sure you saw some interesting stuff! The food is absolutely amazing there and so fun you got to catch a gator game! ah it looks like you guys had a blast! what a great trip - and you got to see so much. the cemetery area in the garden district looks so pretty. and love all the food snaps! now i'm hungry! great recap girl!! I've never been to New Orleans... but these pics are really making me want to go!! When the alarm went off this morning I was like this has to be a joke......then I look back and see how much we fit into a weekend and it all makes sense! Such a great time and so much food. Those tours are such a great idea! Do they have them in every city or just NOLA? I love that idea of the cost of it like that. I love New Orleans! I've only been for sporting events: Final Four & Super Bowl, and never really got to explore the city then. I want to go back! Girl, I am drooling over all of that food especially the scalibut! 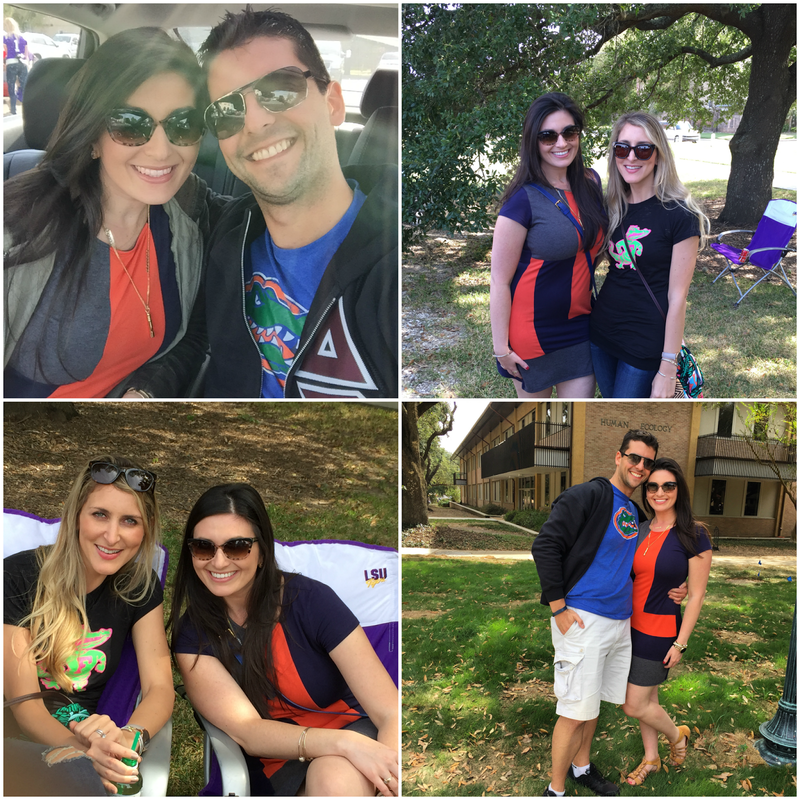 Looks like you had an amazing time, but so sad for your Gators! I have never been to New Orleans so if I ever go, I will come back to this post and basically do everything you did! Wow, what a whirlwind weekend! We tried to go into New Orleans on our way to Houston a couple of years ago but there was some big festival going on and it was a madhouse and there was no parking. Next time! I have heard great things about LSU's fans. I know they were particularly nice to all the U of South Carolina fans who traveled there when the game couldn't be playing in Columbia a couple of weeks ago. Hope you have a great week! What an awesome weekend!! It looks like you got to do so much! I'm sorry about your Gators - we watched it on tv, and it was a good game! I'm so glad you had a wonderful weekend - with the exception of the game, of course - in my home state! I was SO hoping Florida would win! It was a great game! That looks like so much fun! Sad about the game, but glad you had a great time in NOLA! PS. love that fashion illustration! Beautiful pictures. You made me want to visit New Orleans some day. I liked the architect of those old buildings. What a whirlwind of a weekend!!! I've always wanted to go and visit. Such a lovely city! Such a great place to visit!! I would know haha. But a few insider tips, never visit Cafe Du Monde at night on holidays or around big events, it's crazy packed. Glad to hear you had so much fun in the Big Easy. Your snaps were so fab! I enjoyed seeing snippets of Nola. Looks like it was a great trip. I love your game day attire. Nola is so pretty, you got some really great pictures. Oh my goodness, you definitely had a FULL weekend. What fun!!!! Sounds fabulous and if I ever make it down there, I definitely will be using your recommendations! So glad you had such a great trip!! This has me dying to go back! Specifically for beignets and we loved the red fish at Red Fish Grill, too! And I hear you on Bourbon Street craziness - we were there during the week and our first day I could not get over how insane the place was on a MONDAY night!!! What a great trip! I have always wanted to go see New Orleans but never have!!! What a whirlwind weekend down in Louisiana! It's awesome when you can find nice fans at other schools who open up their tailgate to visitors... we found a few of those in Louisville earlier this year. Hope you find enough coffee to make it through the day! What an amazing weekend!!! 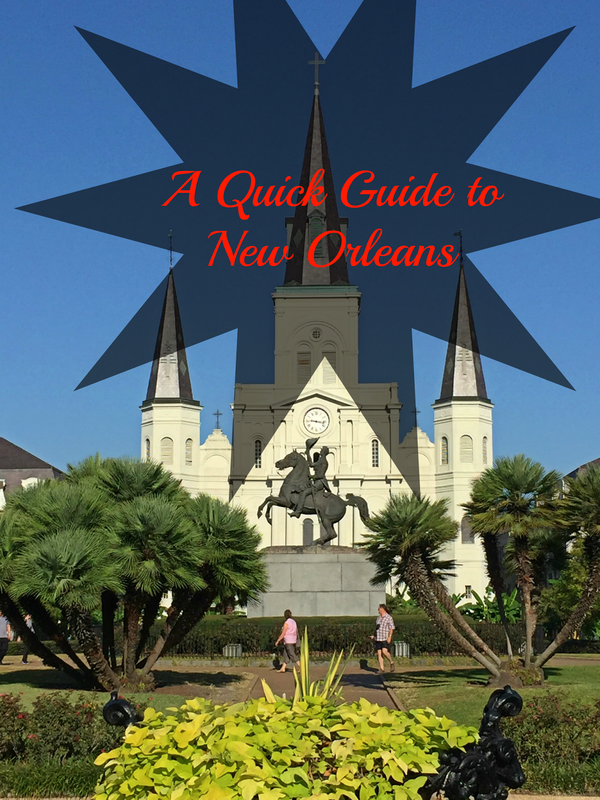 New Orleans is definitely on my list of places to visit and this post is so helpful!! Looks like you guys had a blast! This is one of my favorite cities too! You definitely don't have to be a huge party person to enjoy the city--I've visited both in my wild, single days, and as an old married couple, and I think I enjoyed it more as an old, married person! That was probably because I wasn't broke like in my early twenties, which meant I got to have plenty of incredible meals (oh, and I guess it was nice seeing the city with my soulmate too :))! What a weekend! 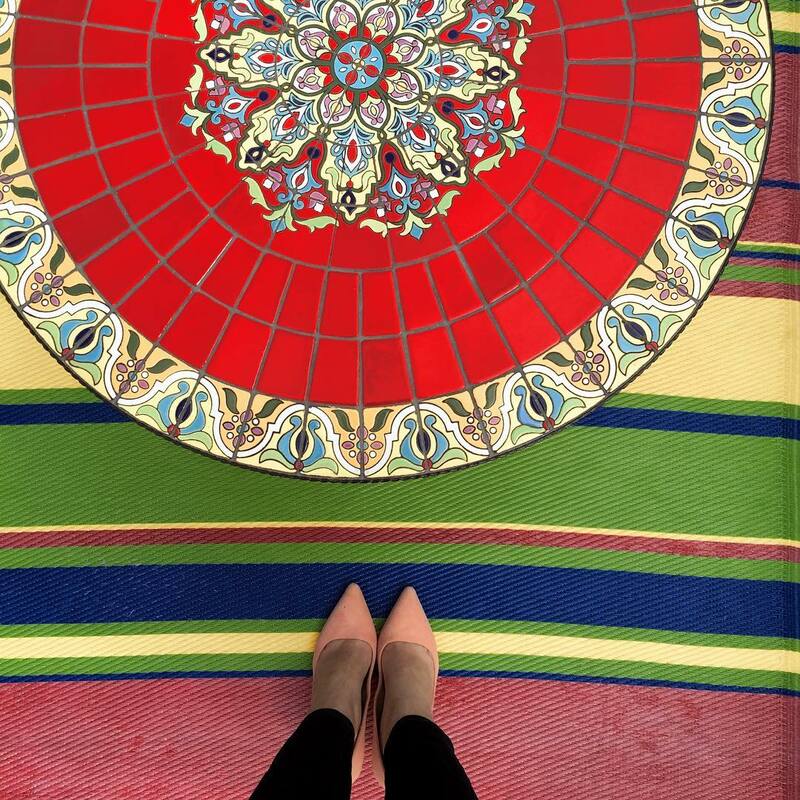 Loved all your snaps and love this guide! I have always wanted to visit New Orleans, it seems like such a fun place! I cannot believe that dog was dyed purple. That's a true fan!! Happy Monday! I adore NOLA and I also adore beignets, I buy the pre-made mix so I can make them at home as a special treat whenever I want! Looks like such a great trip!! Jason and I talk about going to a game at another school for a trip like this. NOLA is for sure on my list! You went to all the good places! I stayed in the Roosevelt last time I was there and stopped by Domenica a couple times. 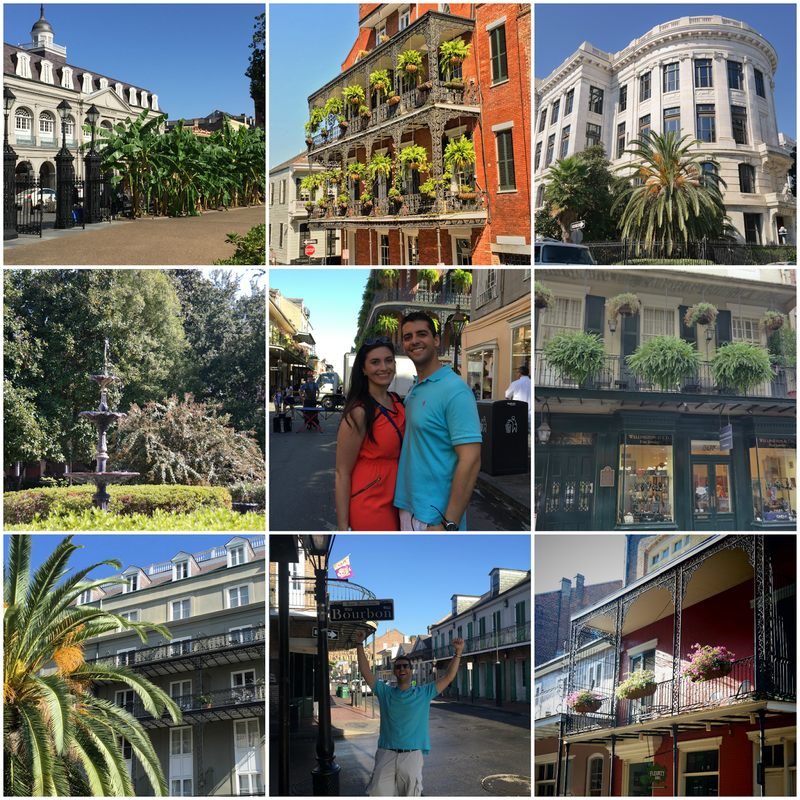 New Orleans looks like such a gorgeous city and is high up on our travel list so I loved looking through these photos! I love how much you guys managed to see and eat – everything looks perfect minus the outcome of the game but it looks like you guys had a great time at the stadium anyway! See, this post gives me hope because I've always wanted to go to NO, but I never have a full week to go, and I feel like there are so many things to do that just a weekend wouldn't suffice. But, you look like you had an amazing weekend. I need to take a page out of your travel book! Wow, you guys packed in SO MUCH! What an amazing, amazing trip! Now I want to go there even more!! This looks like an AMAZING weekend!! I'm honestly shocked at the amount of things y'all got to see and do since you had the football game. Your pictures are beautiful! THAT DOG!!!!!!!!!!!!!!!!!!!!!!! OH my gosh!! That's so funny! You always make my mouth water with the mention of all the lobster things you find. Thanks for this great post! We're heading to New Orleans in about five weeks and staying at The Roosevelt. I'm so excited for the food. Even though I don't eat seafood, I know there will be plenty of delicious things to enjoy! Such a great post! I am dying to visit and now I feel even more motivated!! I LOVE your J'adore shirt and that skirt! I LOVE LOVE LOVE Dominica! Especially during happy hour! Sounds like you guys had a fun trip!! I haven't been to New Orleans since the spring of 2001, before Katrina. I remember taking a tour and getting to drive past the Real World house that was there and seeing the cemeteries. The cemeteries are so pretty and cool! Cafe du Monde was my favorite thing and there is just so much good food down there!!! I was thinking about you and Amanda when I watched the game Saturday night. It was a good one to watch! My cousins were there this past weekend too and I was actually looking for them in your photos! Wouldn't that have been something? (; My fiance and I have been talking and I think he and I will make it a point real soon to visit New Orleans together. Looks like you had an amazing time! I love New Orleans! When I went I was there for only about 24 hours! It was such a whirlwind, but if I ever go back I will definitely take advantage of this city guide! Love love LOVE Nola! We've been twice and it's one of my fave places ever. And you aren't lying about it being the city that never sleeps. The last time we went, we didn't get back to our hotel until the sun was coming up. Bourbon Street is always jumping no matter what time of day it is! Glad you guys had a fun time! AH-MAZING! That's all there is to it! SO fun! I haven't been to New Orleans yet but it's on my list! The Carousel bar looks amazing, sad you didn't get a seat! Y'all did so much-you know I'm loving all the seafood you had! That Carousel bar looks like so much fun! I love free tours where you pay what you think the guide deserves. They have them in Europe, and it was our favorite way to get an overview of the city! Looks like an amazing weekend! I can't believe how much fun you packed in! NOLA is definitely on my travel bucket list! Looks like a busy weekend! I've never been to New Orleans but that Carousel restaurant looks amazing! Dessert first, always! So happy to hear you had a fantastic time! We said the same thing about New Orleans being the city that never sleeps. It's actually way more active than NYC. Ee purposely chose not to stay on Bourbon street for that reason but good to know about the ear plugs. Yay for making it to Cafe Du Monde without any crazy lines. Had I known it was 24 hours, I would have gone late night too. Oh well next time. Hope you get to catch up on some rest this week! It sounds and looks like you had a great time! When I was 17, I went to New Orleans with our marching band to play in the halftime show at the Sugar Bowl. I've been dying to go back! We went on a ghost tour in the French Quarter, went on a river boat cruise, and did a ton of sight seeing and shopping. 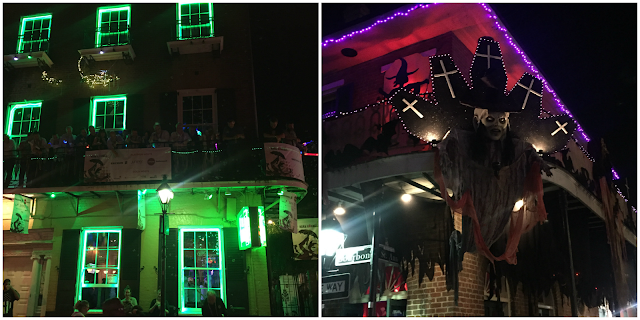 We were allowed to wander around most of the city, with Bourbon Street being the exception! I have always wanted to go to new orleans! looks like an awesome weekend getaway! oh my gosh, thank goodness for the earplugs! i would have freaked out for sure. i have only been to NOLA once, and yeah, I was one of the idiots stumbling home at 5am lol. pinning this in the hope that we can go next year! What a fun jam packed weekend you had! We stayed at the Hotel Monteleone when we went to New Orleans last year. I loved that place and never wanted to leave it! We had a suite and opted for room service more than once and were completely content. I loved the sights we saw but it's way too crazy for me after dark. Lol. NOLA is on my bucket list and has been for such a long time! It looks like you guys had a great weekend. I can't get over that purple pup! Oh my gosh...a purple dog! Hahaha! Yes! I wanted to see the cemetery because of Double Jeopardy as well. So cool! You had a great, full weekend. All the food looked amazing! Oh I miss NOLA. We went there for a small vacation a couple of years ago and I keep telling my husband that I want to go back. 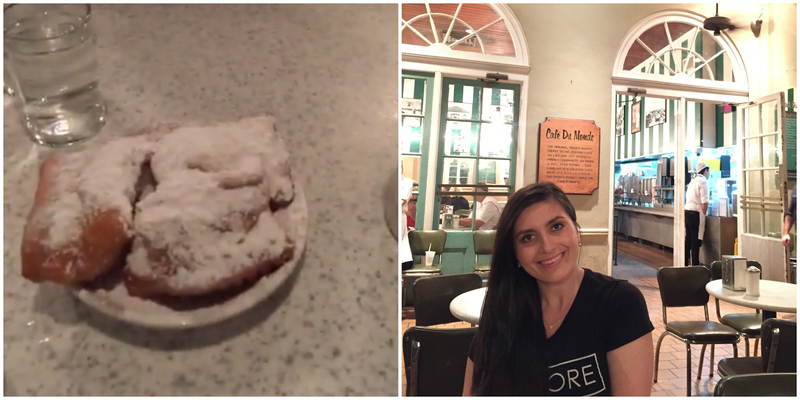 Cafe du Monde is my go to spot (several times a day!) and the French Market is amazing! I lived in NOLA for 5 years and I miss it so much! I've been everywhere you guys went and its all so good, you can't go wrong with a weekend in NOLA! I'm glad that you had such a great time. NOLA is such a fun city! What a fun filled weekend! I've never been, but would love to visit NOLA one day! And the scalibut sounds pretty amazing! So much good food! 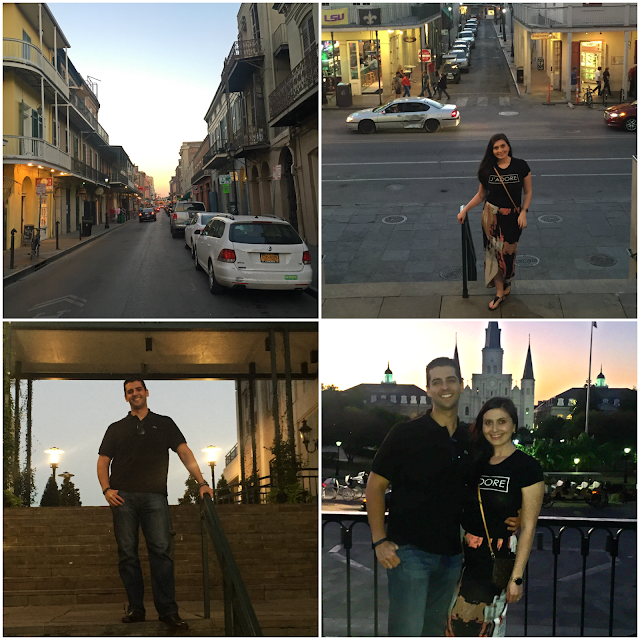 So glad you guys had a good trip-- New Orleans is such an amazing city with so much to do. When we were at the Carrousel Bar, the people next to us went on and on about how we had to go to GW Fins-- we didn't ever make it there, but looks delicious! What a fun trip! You guys squeezed in a lot of stuff! I never knew what a second line was until I got obsessed with the show Four Weddings, lol! That bride's dress is really cool!!! Best part of NOLA is the food!!! I've been wanting to go to NOLA for so long!! I'm hoping to make my way there before the end of the year! I loved following along on your instagram! Looks like you had an amazing time. I really really want to go there now! New Orleans is such a gorgeous city with rich history and beautiful buildings. Bourbon St is honestly the worst part of it...when I went we stayed at the Omni Royal which was a block away from Bourbon St...it was the best hotel because it was close enough to the action without any of the noise! Those tours look like fun, we did the ghost tour, but not one that went through the Garden District...that was definitely a favorite spot of mine. I'm sure we walked past a bunch of celebs houses. We did get to see Angelina & Brad's house, it was a normal looking house which I'm sure was gorg inside! Looks like you had such a great time! I have always wanted to go there, and will have to refer back to this guide if I ever get the chance. That purple dog is to funny!! 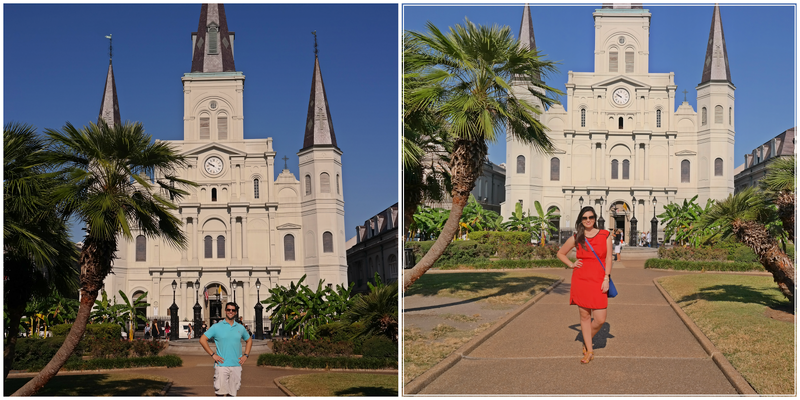 NOLA is definitely one of those cities that I've dreamed of traveling! Your photos only heightened my urge :) Thanks for sharing your travel experience, it was fun! NOLA is definitely toward the top of my list of places to visit. Just the history and food! I can't believe you guys stayed on Bourbon Street! Oh this makes me want to visit so bad! Glad you had a great time and fit so much in! Looks like you did A LOT in a short amount of time and it all sounds wonderful! I am dyyyying to get to New Orleans! A friend recommended GW Fins to me, it's nice to see another vote for that. Was that your favorite meal there? I think MFD is only available for dinner one night (he's doing a conference, I'm wandering) and loves seafood so I want to make sure we make a good choice! Looks like such a fun weekend Biana! I haven't been before, but the food looks amazing and I'd love to go and try some of the signature NOLA dishes :) The sunset photos are gorgeous, especially the one of you and your hubby at the game! I would love to visit New Orleans someday- and I won't miss Cafe Du Monde. Your pictures are beautiful and it looks like you had a great time! This looks like so much fun! I have never been to NOLA, but I always wanted to! !